Sometimes, you have to wonder how people come up with these things on social media. No matter what someone posts, it seems that there is always at least one person trolling for attention by making outrageous statements. Fortunately for us, often times the outrageous commenters are our very own favorite Housewives! 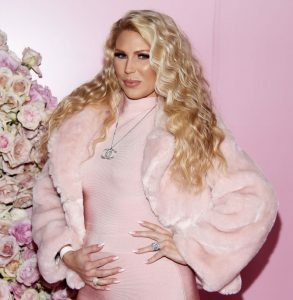 RELATED: Gretchen Rossi Is Pregnant With Her First Child! Gretchen goes on to explain her side by saying, “Because I’m not trying to hide a baby bump. As a matter of fact, here’s my bump, for all of you haters out here. There it is!” Gretchen then showed off her expanding baby bump to Instagram followers in a series of photos. Does anyone really think that someone who has struggled with fertility issues for years would try to hide their pregnancy? Not very likely, if you ask me. Maybe a better question would be, do the posters who are accusing Gretchen of wearing Spanx know her? If Gretchen was wearing Spanx, she would probably be doing so with a sponsorship deal with the company and wear them on the outside of her clothing! Gretchen is the master of the promotional hustle and leaves no stone unturned in making a buck. It would not surprise me if she is working a deal with a stretch mark cream company to promote their products. And has a side deal with Maserati to sponsor her car ride to the delivery room! So, Gretchen seems to have cleared up some strange rumors about her pregnancy. And in doing so, gets her name out there in social media and news feeds. Which might entice a person or two to her Gretchen Christine website. As a matter of fact, Gretchen could probably teach a Master Class to struggling current/former Housewives trying to promote themselves. Brandi Glanville and Sonja Morgan-there is a discount if you reserve your seat early! TELL US-DO YOU THINK GRETCHEN HANDLED THE SOCIAL MEDIA ACCUSATIONS AGAINST HER WELL? WHAT IS THE MOST OUTRAGEOUS SOCIAL MEDIA POST YOU HAVE SEEN ABOUT A HOUSEWIFE?